A Day at the London Film Festival. On the 6th of October I jumped on the train to attend the BFI London Film Festival, I’d never attended before and was excited to see how it would compare to similar scale festivals I’ve been to previously. I had tickets to see 2 films I’ve been excited about months Amma Assante’s A United Kingdom and the first Non-Japanese collaboration from Studio Ghibli The Red Turtle both of which were conveniently screening at the big Odeon Cinema in Leicester Square. I got there ridiculously early (which won’t surprise anyone who knows me). My first screening of the day was at 11:30am, it happened to be the Gala Screening of the night before and they were packing up the rest of the red carpet and wall when I got there. So I waited outside the box office, picked up my tickets and was ready to begin. Set in the 1940s and starring David Oyelowo (Selma, Queen of Katwe) and Rosamund Pike (Gone Girl, Pride and Prejudice). A United Kingdom tells the story of the real-life marriage between Seretse Khama, Prince of Bechuanaland (now Botswana) and British office clerk Ruth Williams and the international uproar their union caused. I absolutely loved this film. It was emotional, funny and heartbreaking in places. It tackles feelings of identity, love, and prejudice from both countries involved. The film’s score compliments the sweeping romance of the film whilst the cinematography captures the two very different countries perfectly using colour and framing. This feels like a triumphant and culturally relevant film. Definitely, recommend! This wordless animation follows a man stranded on a desert island who is prevented from leaving by a mysterious giant red turtle. As I said previously, this is a collaboration with Studio Ghibli and french director Michael Dubok de Wit. For me, seeing the familiar logo of the studio at the start of the film filled me with emotion immediately. This is a very different animation style to the Japanese films made at the studio and Michael Dubok de Wit described the creative freedom he had working with them during the Q&A as an “adventure” for the both of them. The film itself was beautiful animated and simplistic which made up for it being slightly predictable in its story. When asked at the Q&A why he chose for the film to have no dialogue he explained that he didn’t want the audience to know the nationality or cultural background of the character allowing him to be a blank canvas for the audience to project on. I think this worked perfectly in the context of the film and I really hope that Studio Ghibli does more collaborations in the future. Overall, I have a great time and would love to go back next year for longer! Did you attend the BFI London Film Festival? If so, what did you see? Author emilysteelefilmPosted on October 14, 2016 November 2, 2016 Categories Film, Film FestivalsTags A United Kingdom, BFI, Day in the life, film festival, London Film Festival, personal, The Red Turtle2 Comments on A Day at the London Film Festival. 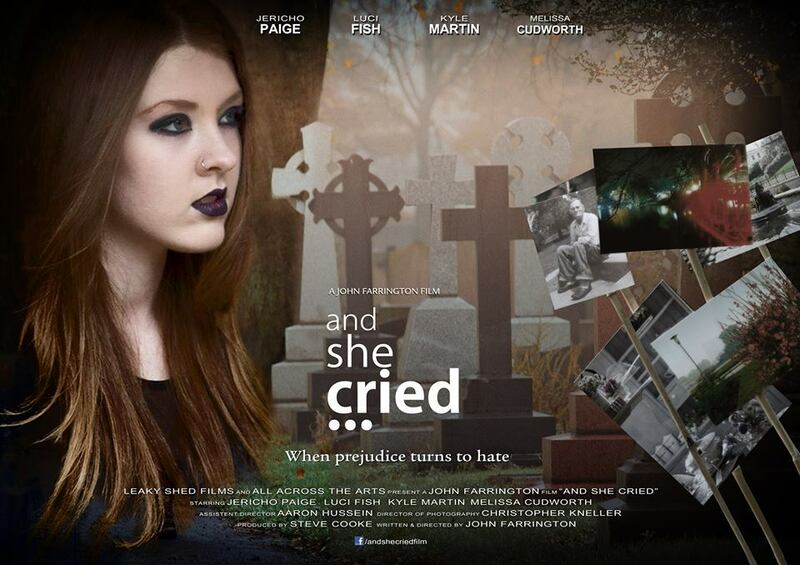 This is the new promotional image for the short film project “And She Cried” in which I was Second Assistant Director. Since the second week of January, “And She Cried” has been in post production but we now have the semi-confirmed premiere date in May. This news is incredibly exciting and I’m really happy to have been a part of this project. I’m looking forward very much to seeing the film when it is completed. Author emilysteelefilmPosted on February 25, 2014 March 4, 2014 Categories Film, My WorkTags and she cried, blog, film, john farrington, leaky shed productions, personal, project, Sophie LancasterLeave a comment on “And She Cried” Update.